A few months back, an advertising executive argued that more online privacy would kill free speech. Richard Frankel, president of the advertising company Rocket Fuel, titled the post “How the Do Not Track Plan Will Ultimately Kill Free Speech.” It’s understandable that advertisers are so resistant to the concept of Do Not Track – it could change the way they access data, which would force them to innovate their business models and practices. Just because DNT could impact the advertising industry in the short-term, however, doesn’t warrant its intense broadcasting of fear, uncertainty and doubt (FUD), and at times, outright deception. Frankels’s piece was one in a string of ad exec attacks on privacy that claim that the Internet will be doomed if consumers get more of the privacy they want. In the interest of transparency, let me explain my angle here. I’m an attorney, privacy advocate, and analyst at Abine, an online privacy company in Boston. We make simple tools that give people a choice over whether their personal info is collected, stored, and sold online. Unlike the advertising companies, we don’t collect or sell any user data. We only get paid if users like our free products and choose to buy our premium ones. It’s an up-front relationship that’s clear to our customers. And beyond my role at Abine, I care deeply about preserving the web as a place where we can say and explore interesting, sometimes controversial, things. As a fan of free speech and expression, I have a vested interest in keeping the Internet open and uncensored. Make no mistake about it: we live in a state of surveillance. Hundreds of advertising and tracking companies follow everything we do online — the articles we read, the videos we watch, the sites we always visit, the Facebook comments we make, and more. They combine that online data with offline data like our voting record, employment history, and marriage licenses, and use it to build an extremely detailed profile. Companies like Facebook scan the contents of photos and private messages for Homeland Security “risk words” like “infection,” “body scanner,” or “hacker” and turn them over to law enforcement. Even if you delete your embarrassing Facebook posts, companies like Social Intelligence sell the past 7 years of posts to hiring managers. The wireless companies you pay for mobile service turn over 1.3 million customer records to law enforcement each year, which include texts and your phone’s GPS location wherever it went. The divide between public and private surveillance is virtually nonexistent, and advertising companies are part of this ecosystem. When you’re constantly being watched, you necessarily lack privacy. And when you’re constantly being watched, you act differently. That seems like an obvious point to those of us who’ve belted out song lyrics alone in our cars but would be terrified to do the same on stage in front of thousands or who laugh at things with their friends that they’d never say in front of their bosses, but observation effects are also well-established in scientific research, law, and popular culture (Big Brother, anyone?). Privacy scholar Neil M. Richards writes that “surveillance inclines us to the mainstream and the boring…when we are watched while engaging in intellectual activities, broadly defined—thinking, reading, web-surfing, or private communications—we are deterred from engaging in thoughts or deeds that others might find deviant.” Deviance just means difference: deviation from the norm, creativity, standing out from the crowd. If you knew you were being watched and that your activities may resurface down the road in a job interview, on a date, in a newspaper, you’d be less likely to go that political rally, that Alcoholics Anonymous meeting, that gay bar, or that protest, all things that you have a right to do that are valued parts of a free, democratic society. With privacy, you have control over who gets to see what you’re doing and where you are. You get to be one way around your boss, another around your kids, another around your best friends since elementary school. You get to pick that divide. But when you’re watched all the time and you never know how that information will be used or where it’ll turn up, you censor yourself everywhere. This is called the Panopticon Effect. All this openness that social networks insist we want by default, the pervasive data collection that advertisers argue is good for us: they make anyone who’s paying attention censor themselves. A key part of free speech is anonymous speech. Anonymous speech is a constitutionally protected First Amendment right, and as the Supreme Court stated in McIntyre v. Ohio Elections Commission, “an honorable tradition of advocacy and of dissent.” Online advertising constantly fights against anonymity and pseudonymity, trying to learn everything about web users to unmask them and peel away layers of demographic info, interests, and behaviors. Many social networks like Facebook have real name policies, insisting that members use their full, legal names on their accounts or be banned. Frankel says that “With higher ad revenues comes more rich content that spurs vibrant discussion.” I disagree. You know what spurs vibrant discussion? People, especially people behind pseudonyms. Ever been on a message board? A Reddit thread? The most “vibrant” discussions happen when people feel sufficiently protected to be honest. Sure, some people hide behind pseudonyms to harass others, but the core of the First Amendment avoids censoring the positive, protected uses of speech just because certain bad actors may abuse it. To say that advertising is the only thing driving creative content doesn’t give credit to humanity’s ingrained creativity. First, plenty of content providers get paid for their work directly, from recording artists to bestselling authors to journalists. 43% of Americans pay content creators—authors of magazine articles and books—for e-books, and there are 400,000 paid subscribers to the Wall Street Journal alone. The majority of people blogging and posting on social media today create content out of a desire to express themselves that’s unrelated to money. Just talk to any one of the thousands of bloggers and podcasters, particularly the anonymous ones, who pay to host their own websites just to get their message out to the public. Most of these people don’t blog or podcast for a living; they do it because they love it and because their message is important to them. There’s power—and satisfaction—in speaking one’s mind, and it exists independently from ad money. 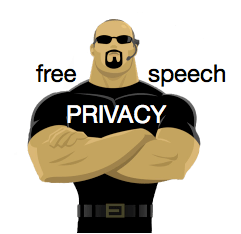 Privacy isn’t a hindrance to free speech; it’s the driving force behind it. Privacy provides both the boundaries of and protection for the space in which we can be ourselves. Privacy nurtures self-expression, creativity, speaking your mind, associating with whomever you wish, and exploring your interests. These are the First Amendment’s protections: freedom of speech, of association, and of assembly. They’re so important for self-actualization and self-determination that our founders immortalized them in the Bill of Rights. Privacy isn’t about having something to hide; it’s about having something to live for. My privacy is important to me. That is why I use DNT.I Am grateful for companies like Abine, who make software that helps my privacy. Thanks! We’re grateful that we’re able to help you out. It’s great you offer such a brilliant service….. At least it’s an OPTION! That’s all I want. Yep, that’s our stance too: privacy should be an option. You should be able to choose it if you want it, and it should be easy. I do not think i spam or abuse writing a little comment if you allow me. It is a very nice article that you have written madam, with so much passion. Freedom of speech and privacy are not always working forward (front) sometimes it is working also backward (rear). Of course, it is at the opposite of your article : privacy is with your rights and the freedom of speech, but privacy and freedom of speech it is also the right to erase its own contribution so, if it is not possible ; more privacy kill free speech. Because, the owner of your rights will be the place and the few ears where you have written or spoke ; so you will be in a close area of space, of time with only few words, few ideas or like in farenheit 451; you will not have the choice to be free, repeting the words of someone else like a character at the theater. I do not really understand what is the first amendement and the bill’rights. In fact, privacy is about a need – psychological – of a child in the purpose to help him to grow up savely and in good health mentally, a protection for his mind. So, saying that it is a modern and real concept and very important for an adult ; it is a little fun. Free speech help to built ideas and creativity so i agree with you. I hope i have really well understood your article and i have not made a confusion. Thank you to have allowed me to comment your article with easy words. I have inappropriate content posted in Search on me that most is old and inaccurate Google search 123 People will not remove web links or pictures that I want removed. Thanks to you I can stop them from collecting more information about me. They need to be sued. Thanks Sarah and you were right about 123 People. I worked with the manager and it was taken off fairly fast. Thanks to Albine and the masked e-mail. I choose what is published on the web. Thanks again! Nice! Glad to hear it worked for you. You wrote about one aside of the coin. What process is in place that prevent people hiding behind pseudonyms to harass others? Is it required that the person being harassed jump-through-hoops in order that Abine assist with putting an end to the madness?. I understand most people do not abuse a service such as those offered by Abine, as always there will be a few. Thank you, Sincerely “In fear of life”.